Principal Don Moorer leads students at the new Boys Academy as they conduct their daily libations. He took the entire school of sixth- and seventh-graders to USC on Tuesday morning to tour the campus and show them a university they might someday attend. Many of them asked questions about what kind of grades they would need to get into the school, and what the best path was for them to get there. And then, in the final hour of their day, dignitaries came to their school: Superintendent Michelle King, state Sen. Steve Bradford, Local District West Superintendent Cheryl Hildreth, LAUSD Police Chief Steve Zipperman, and four school board members. The boys were naturally antsy, and they kidded, talked, and played around while lining up and listening to the speeches. When the boys were told that multi-Oscar winner Denzel Washington once portrayed McKenna in a movie, and they quieted down. Superintendent King thanked the parents for bringing their children to the district school, which is another of the new alternatives the school district has come up with to be more attractive to local communities. “This is one of the few schools of this kind in the whole state, and I am grateful that you took a chance on us,” King said. The Boys Academic Leadership Academy is at half its potential enrollment capacity at the moment, but the principal said he may have more students in the next few weeks, which could require them to expand their staff of five teachers. The office of the Boys Academy is in buildings that are offset from the main campus of Washington Prep. The office has banners of universities across the country to keep the next step of education always in the minds of the students. An all-girls district school and an all-girls charter school opened last year, and the boys school received $700,000 to revamp this part of the campus to add an outdoor stage and meeting area and as well as a music room with drums and guitars. The boys are mostly African-American, but there was a sprinkling of other ethnicities in the new school. 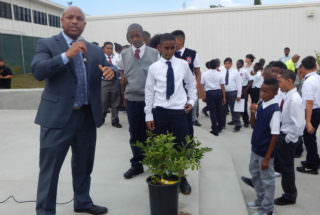 The special guests and media were shown the school’s daily Town Hall where they water a lemon tree with “libations,” well-wishes for themselves and the community. Then they read the William Ernest Henley poem “Invictus.” The lemon tree will be planted in the center of campus and grow and provide fruit for the campus to eat and make lemonade as they all grow older, Moorer said. McKenna was particularly emotional watching the ceremony. He went to an all-boys segregated high school in the South and was delighted to see that an all-boys school can work in Los Angeles. The Boys Academic Leadership Academy is still accepting enrollment at 1511 W. 110th Street.